Good morrow*, my friends! Victoria Jamieson hath done it again! I know so many adults and students that LOVE Roller Girl and I know they will be so excited to pick up this new graphic novel from the same author. Recently released and in paperback, this is a very accessible book for upper middle grades this fall. Students in middle school will appreciate and relate to Imogen’s struggles. 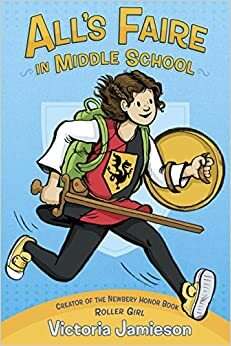 To her friends and family, Imogen is called Impy and not everyone at her new school knows that her family works at the local Renaissance Faire. Impy herself is training to be a squire, which is like a knight and is something she is very proud of. However, she quickly finds out that things she overlooked in the past, such as her family’s quirky ways, their small apartment they call home and her thrift store clothes are not considered cool by her new middle school friends. Impy desperately wants to fit in and will do almost anything. Even something she knows is wrong. This book is impossible to put down and was one that was easily read in one sitting. I loved learning about life at a Renaissance Fair and getting a blast back to middle school. Jamieson nails the middle school voice and I know kids in grades 6th and up will enjoy this one! *”Good morrow” means “good day” in Renaissance Faire language!